The fiscal multiplier effect occurs when an initial injection into the economy causes a bigger final increase in national income. For example, if the government increased spending by £1 billion, there would be an initial increase in aggregate demand (AD) of £1bn. However, if this injection eventually caused real GDP to increase by £2 billion, then the multiplier would have a value of 2.0. If the government spent an extra £3 billion on the NHS this would cause salaries/wage to increase by £3 billion; therefore National Income will increase by £3 billion. However, with this extra income, workers will spend, at least part of it, in other areas of the economy. For example, if they spent 50% of the extra income there would be another £1 billion injected into the economy. e.g. shopkeepers would earn money from increased sales. This extra spending would cause an increase in output. Therefore firms would employ more workers and pay higher salaries. In other words, if you increase salaries in the NHS, it isn’t just NHS workers who benefit from higher incomes. It is also related industries and service industries who see some benefits. In the next period, workers spend part of this extra income – in shops and for transport. The suppliers also employ more workers – creating more employment. This creates an additional economic output of £1bn. 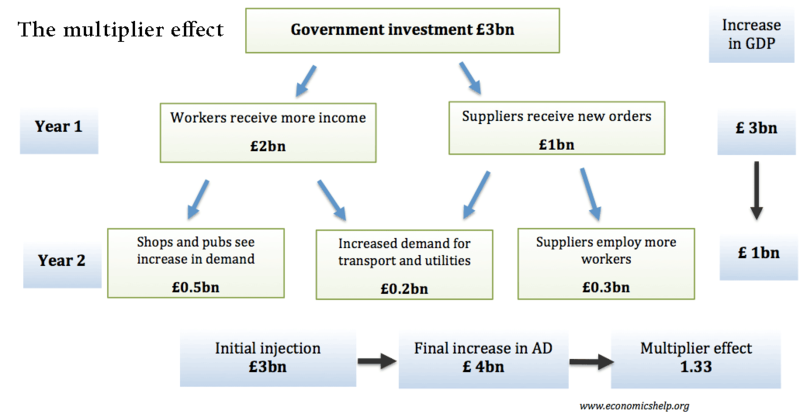 Therefore the final increase in GDP is £4bn – from the initial injection of £3bn. The multiplier effect can also work in reverse. If the government cut spending, some public sector workers may lose their jobs. This will cause an initial fall in national income. However, with higher unemployment, the unemployed workers will also spend less leading to lower demand elsewhere in the economy. The value of the multiplier depends upon the percentage of extra money that is spent on the domestic economy. If people spend a high % of any extra income (a high mpc), then there will be a big multiplier effect. However, if any extra money is withdrawn from the circular flow the multiplier effect will be very small. The multiplier will also be affected by the amount of spare capacity if the economy is close to full capacity an increase in injections will only cause inflation. Firstly, if consumers maintain the same spending habits, they will have more disposable income left over to buy more goods. Secondly, they may be encouraged to buy goods (especially expensive electrical goods) e.t.c because they are cheaper. Therefore, in theory, a tax cut should boost consumer spending and this leads to an overall rise in AD. This means firms will get an increase in orders and sell more goods. This increase in output will encourage some firms to hire more workers to meet higher demand. Therefore, these workers will now have higher incomes and they will spend more. This is why there is a multiplier effect. Extra spending benefits others in the economy. Monetarists argue the fiscal multiplier will be limited by the crowding out effect. E.g. 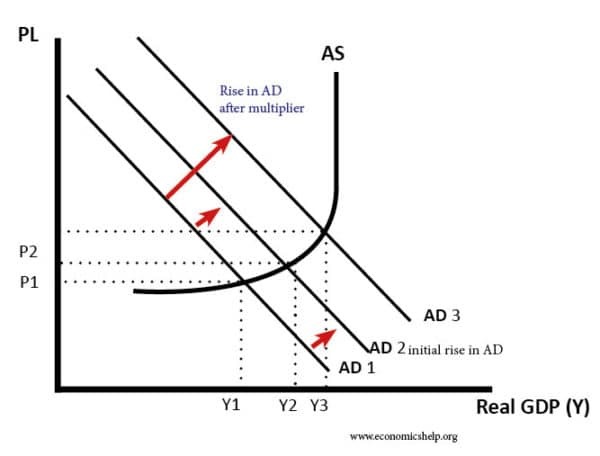 if the government increase aggregate demand through higher spending or tax cuts then this increases consumer spending. However, the rise in borrowing (and higher bond yields) leads to a decline in private sector investment. Therefore, there is no overall increase in AD. However, in a recession, Keynesians argue that the private sector typically has a glut of non-productive savings, therefore, the crowding out effect is limited and there will be a positive multiplier effect. Thanks for that – clears up some questions. You raise that M should increase as well – in representing the effect of the multiplier, I’m thinking that C and I should increase by enough to cancel out the increase in M, whilst maintaining the correct ratio of each propensity (to consume, to invest, to import)? Hope that makes sense. M (imports) will rise as C (consumption) rises. Typically M may account for say 0.4 of any rise in C.
So if you get an extra £10, £4 goes on imports, £3 on taxes leaving an increase in C of £3.